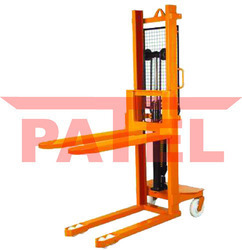 Manufacturer & Exporter of a wide range of products which include Hand Stacker such as Hand Stacker, Electric Pallet Stackers, Hand Stacker, Die Loader, Pallet Handling Equipment, Stacking Machine, Unloading Machinery, Battery Operated Hydraulic Stackers, Semi Electric Hydraulic Stacker, Handling Machinery, Electric Pallet Stackers, Handling Machinery, Semi Electric Hydraulic Stacker, Sheet Stackers, Unloading Machinery, Mini Hand Stacker, Pallet Stacker, Manual Stacker, Die Loader, Stacking Machine, Semi Electric Stacker, Battery Operated Hydraulic Stackers, Pallet Stackers, Hand Stacker, Stacker Machine, Hydraulic Hand Stacker, Hydraulic Pallet Stacker, Electric Pallet Stacker, Stacker Machine, Sheet Stackers and many more items IN Naroda G.I.D.C., Ahmedabad, Gujarat, India. Manufacturer & exporter of a wide range of industrial cylinder trucks. 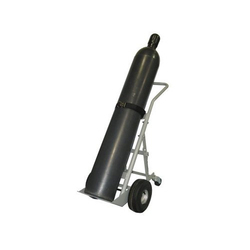 Also deals in hand truck, service carts, wheel dolly & trolleys and cylinder trucks from India. Our organization specializes in offering a superior range of Hand Stacker. These product provide hydraulic cylinder part would be supported by single acting cylinder piston rod is inducted with hard chrome plated. The sealing arrangement is of polyurethane seals, teflon seals for long life smooth working. Leak proof viper seals will be given to protect from ingress dirt & dust. We are emerging as one of the leading manufacturers and exporters of comprehensive range of Electric Stacker, Electric Stacker, Electric Stacker exporters, Electric Stacker wholesalers, Electric Stacker traders, Electric Stacker producers, Electric Stacker suppliers, Electric Stacker manufacturers, Electric Stacker manufacturer, Electric Stacker manufacturing companies, Electric Stacker companies for your sourcing needs, Electric Stacker Manufacturers, Electric Stacker Suppliers & Exporters, Electric Stacker production centers. 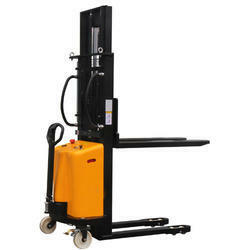 Liftomatic stackers – an indispensable auxiliary for all types of enterprises. 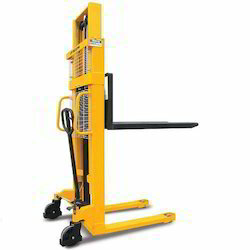 Liftomatic – 5/8/15 are extremely versatile manually operated stackers. 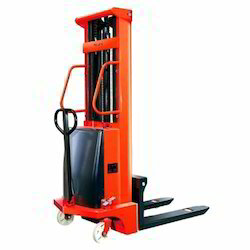 They are very useful for loading, unloading and stacking operations. With a detachable platform on the fork they can also be used as an adjustable worktable. We are engaged in manufacturing of the Battery Stacker, Battery Stacker, Battery Stacker exporters, Battery Stacker wholesalers, Battery Stacker traders, Battery Stacker producers, Battery Stacker suppliers, Battery Stacker manufacturers, Battery Stacker manufacturer, Battery Stacker manufacturing companies, Battery Stacker companies for your sourcing needs, Battery Stacker Manufacturers, Battery Stacker Suppliers & Exporters, Battery Stacker production centers. 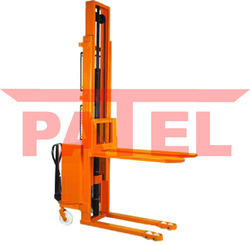 We are emerging as one of the leading manufacturers and exporters of comprehensive range of Electric Pallet Stackers, Electric Stacker, Electric Stacker exporters, Electric Stacker wholesalers, Electric Stacker traders, Electric Stacker producers, Electric Stacker suppliers, Electric Stacker manufacturers, Electric Stacker manufacturer, Electric Stacker manufacturing companies, Electric Stacker companies for your sourcing needs, Electric Stacker Manufacturers, Electric Stacker Suppliers & Exporters, Electric Stacker production centers. Structure simplex single mast structure made from heavy duty c channel section. We are engaged in manufacturing of the Semi Electric Hydraulic Stacker, Battery Stacker, Battery Stacker exporters, Battery Stacker wholesalers, Battery Stacker traders, Battery Stacker producers, Battery Stacker suppliers, Battery Stacker manufacturers, Battery Stacker manufacturer, Battery Stacker manufacturing companies, Battery Stacker companies for your sourcing needs, Battery Stacker Manufacturers, Battery Stacker Suppliers & Exporters, Battery Stacker production centers. Looking for HAND STACKER ?